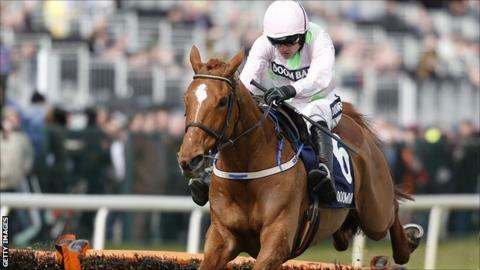 The 2016 Champion Hurdle winner Annie Power has been retired, says trainer Willie Mullins. The nine-year-old is in foal to 2012 Derby winner Camelot and had not raced since last year's Aintree Hurdle win. Annie Power, ridden by Ruby Walsh, became the first mare in 22 years to win the Champion Hurdle at Cheltenham. She fell at the last when leading in the Mares Hurdle a year earlier, denying a Walsh-Mullins four-timer which would have cost bookmakers £40m. Mullins told the Racing Post: "She retires with an outstanding record, winning all but two of her 17 races. "She was a very special racemare and gave us many memorable days." Annie Power, named after an Irish patriot, flew the flag for Irish racing and for female horses in spectacular style. The tributes will of course start with her Champion Hurdle success when positively slamming My Tent Or Yours and Nichols Canyon. But the image that'll last longest in my mind will be 'that fall', at the last, when sure to win the 2015 Mares Hurdle at Cheltenham. In my mind's eye, it all happens in slow motion, a never-to-forgotten tumble that instantly saved the betting industry a massive pay-out at the start of the Festival - with three days still to go.